People play and sing music for any number of reasons, including entertainment, for passing on information, for prayer, to rankle, to protest and so much more. "Shape Note singing" or "Sacred Harp" is a form of vocalizing for people who want to be part of a community of voices. Many of the pieces are based on hymns but the style of singing is not bound to any denomination. There are groups all over the United States who get together every week to sing and socialize (it is reported that young Abraham Lincoln and one of his girlfriends sang together.) The music may remind one of earlier times when people gathered together, talked, ate, and sang, all to wash away the stress of the harsh work week. 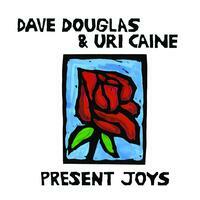 "Present Joys" (Greenleaf Music) brings together long-time friends and collaborators Dave Douglas (trumpet) and Uri Caine (piano) for 9 duets (and 1 solo piano piece) that takes its inspirations from the Sacred Harp songbook. The emphasis throughout is on melody and interplay, harmony and support, telling a musical story without resorting to flights of technical fancy. 5 of the tracks come directly from the songbook, including the opener ""Soar Away"; the gentle trumpet melody and the piano counterpoint immediately puts the listener into a more meditative state. Caine opens his solo with a discordant note but soon moves back into the flow. The title track takes a traditional tune, plays the opening verse straight, and then moves into a bluesy exploration of the melody. There is a playful quality to "Ham Fist"; from the opening piano intro (terse chords) to the handsome melody (reminiscent of Clifford Brown) and the rousing solos over a rolling piano rhythm, the track oozes joy. More "rolling" piano lines enliven "Seven Seas", a piece that blends its smartly written melody with the feel of a "Fats" Waller tune. Caine goes its alone on "Old Putt", a quiet ballad built from tolling chords. The pianist develops the melody slowly, allowing the song to unfold like a poem. That feeling can be felt as well on the following track, "Zero Hour", the final cut on the recording. Caine's gospel-infused solo rises out of the contemplative trumpet lines, first pushing at Douglas then taking off on a glorious romp. "Present Joys" soothes and cajoles the listener, allowing one to step away from the stress of daily life and enter a world of creative elegance (or elegant creativity). 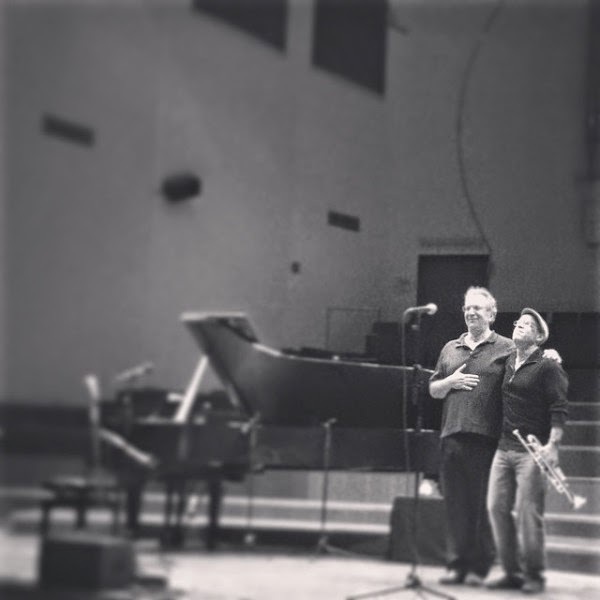 Dave Douglas and Uri Caine, both creative forces on the contemporary music scene, have created the most joyous of escapes, one that reverberates in the mind and heart long after the last notes fade. For more information, go to www.greenleafmusic.com/present-joys-released/. Saxophonist/composer Andrew Rathbun, a native of Toronto, Ontario, Canada, released his debut as a leader in 1999 yet I'm pretty sure he's not as well-known as he should be. Part of the reason is that he records for Nils Winther on his SteepleChase label based in Denmark, a company that does not always get the best distribution in the US. Yet, like Gerry Teekens at Criss Cross, Michael Janisch at Whirlwind Recordings (both labels based in Europe), Winther gives his artists free rein and the music is better for it. "Numbers & Letters" is Rathbun's 6th recording for SteepleChase and, from the opening seconds, the listener knows he/she is in for an audio treat. First, Rathbun employs the splendid rhythm section of bassist Jay Anderson and drummer Bill Stewart plus Phil Markowitz on piano. Second, his compositions all have intelligent, well-shaped, melody lines and the arrangements leave plenty of room for solos. Third, he and co-producer Taylor Haskins (also, trumpet on 2 tracks) worked with recording engineer Michael Marciano to create a "clear and clean" sonic environment in which each instrument stands out without covering any of the others. Bill Stewart really shines on this CD, his drum work so creative and often exciting. He splashes below the tenor and piano on "Pencil and Paper", adding colors and then creating a solid groove ably supported by the thick bass lines of Anderson. There are moments on "Bad Call", the opening track, where it sounds as if the drums are strutting, especially during the exciting piano solo. For the ballad "Sleep Please", his active cymbal work combines with the melodic counterpoint of the bass to move the piece forward. That track also includes a handsome melody for the soprano sax and piano that has a classical feel. Stewart relentless drive kicks "Swing Set" into a higher gear, pushing the tenor sax and piano into solos that really sparkle. "Etude" has a devilish circular melody line, played on tenor that repeats several times before moving into the solos. Markowitz picks up on the opening melody before delivering a rhythmically exciting solo dancing alongside the bass while the drums dance as well. When the tenor returns, the intensity level picks up, the drummer kicking and splashing with glee. There's quite a drive to "Sculpy", great potency at volume. Rathbun's tenor skips along atop Stewart's snappy snare work and Anderson's running not "walking" bass lines. There's plenty of music on "Numbers & Letters" (nearly 70 minutes) and nary a dull moment. Andrew Rathbun and company put on quite a show with being showy. Bill Stewart deserves major kudos, not to slight the rest of the band because everyone gives their all. It's worth finding this music because the rewards are plentiful. For more information, go to www.andrewrathbun.com. What we have here is the 4th CD by French saxophonist/composer Stephane Spira (tenor and soprano), "In Between" (L'Autre/JazzMax), recorded with ex-patriate Glenn Ferris (trombone) and the New York City-based rhythm section of Steve Wood (bass) and Johnathan Blake (drums). As with the Rathbun CD, one first notices the exemplary work of drummer and bassist. The first 3 cuts alone recommend this date. Blake lays down such a solid and appealing dance beat on "Cosmaner" while Wood's bouncing bass lines underscore the sweet melody. "Dawn In Manhattan" is slower but has such a irresistible rhythm. The blend of tenor sax and trombone alcoves appealing, with the leader's solo floating above the bass and drums. A recognizable New Orleans drum pattern and funky bass lines underscore "Glenntleman"; it's hard to sit still as Ferris dances on Crescent City bed (I detect the influence of The Meters). There's more good music on rest of the 12-song program (9 of which are Spira compositions.) "Flight" has more sterling work from Blake and Wood (as well as a "rocking" tenor solo) while a blues feeling permeates the title track. "N.Y. Time" displays the influence of Steve Coleman, especially in the slippery rhythms and short yet strong solos. A sultry Brazilian feel permeates "A Special Place"; the leader switches to soprano for a lyrical solo. Ferris's 'bone solo takes its cue from the rhythm section, as if he is swimming alongside Wood and Blake. 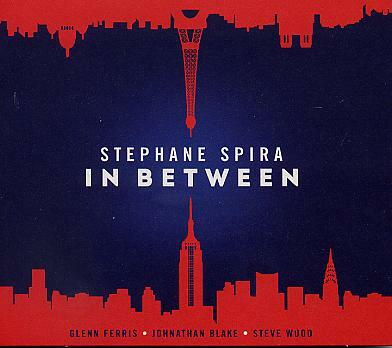 The cover art work for "In Between" suggests Stephane Spira feels a pull from his native France (where this session was recorded) while taking note (no pun intended) of the great influences of New York City (with its rhythmic mash of jazz, hip hop. Latin and South American music.) Whatever moved Spira to create this music, the results are quite enjoyable and worth our time. For more information, go to www.spirajazz.com.